I avoided using quinoa for the longest time because I hate using something simply because it’s “trendy”. However, once I found out how incredibly nutritious it is, I decided to get it to see if I would like it. And I’m happy to report that I did and still do. I make it just like I make my white rice and then mix it up with other vegetables to add more color and flavor. I also mix it with some milk to eat it for breakfast or even to make rice pudding. I really wish people would eat quinoa more often because like I said, it is incredibly healthy for you. It is packed with all kinds of vitamins, minerals, antioxidants and it has a ton of fiber. All of which bring you great health benefits in just one cooked cup of this wonderful seed. I usually buy the pre-washed white quinoa because I find it easier to use. It is a little bit more expensive but I don’t mind paying extra to avoid having to rinse it. 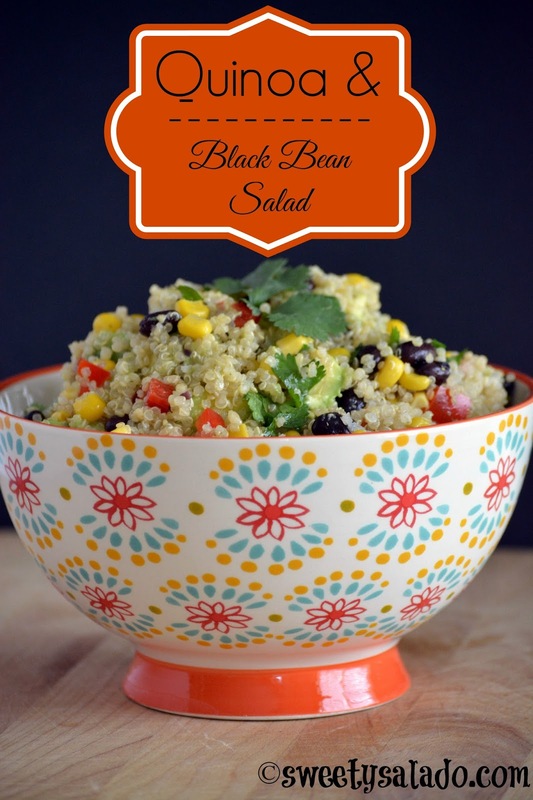 Once you cook it, you can mix it with anything you want, like beans, corn and other ingredients like the ones we have in the delicious recipe below. Rinse uncooked quinoa under cold water for a few minutes if it has not been pre-washed already. Place it in a medium pot and add the water. Cover and bring to a boil on high heat, then lower the heat to low and cook for 15-20 minutes or until all the liquid has evaporated. Uncover, stir and set aside to let it cool completely. 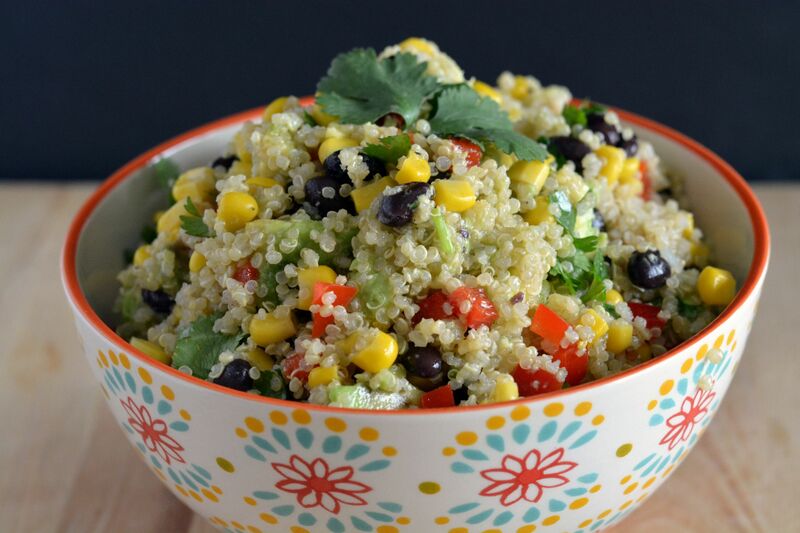 Once the quinoa is cool, place it in a large bowl and add the black beans, corn, red bell pepper, cilantro and avocados. Mix well. Place the last 5 ingredients in a small bowl to make the dressing and whisk well. 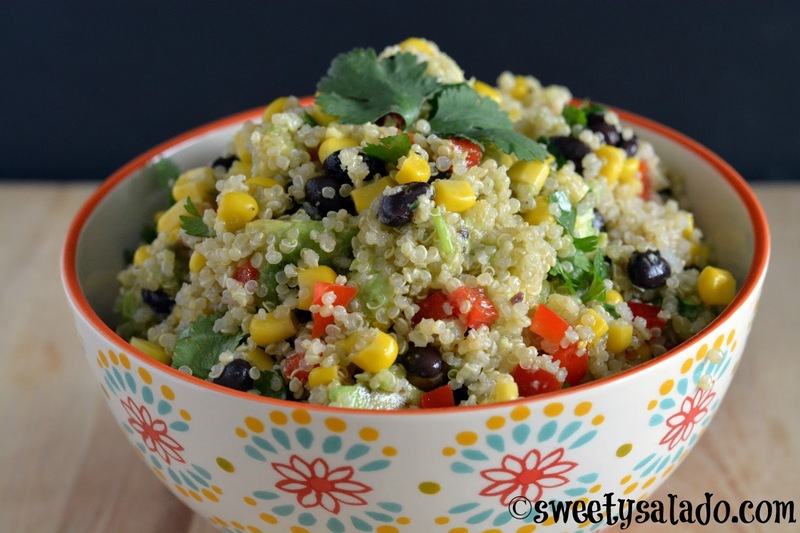 Pour it into the quinoa salad, toss well, cover and refrigerate for 30 minutes before serving.